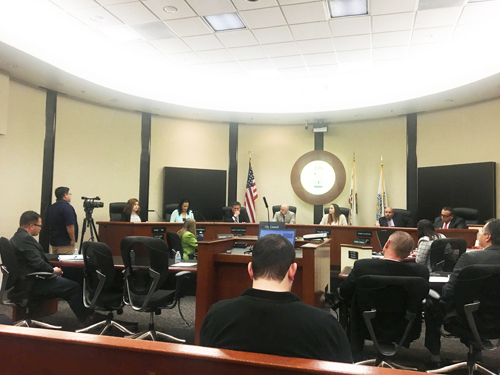 The years of finger pointing and shouting matches that seemed to be a thing of the past in Bell Gardens returned with a vengeance Monday to the southeast city where councilmembers have taken legal steps to officially remove a sitting councilwoman from office. The political drama involves Councilwoman Jennifer Rodriquez who before Monday’s city council meeting was served with court documents informing her that the city has filed a complaint in Superior Court that allege her chronic failure to attend city council meetings amount to her having “vacated” the office. The complaint also demands Rodriguez be fined $5,000 and forced to pay the cost of the legal proceedings. Speaking during council orals Monday, Rodriguez lashed back with her own barrage of accusations. She said her absences were due to illness and claims the council’s action is retaliation for her wanting to make public the amount of money council members make representing the city on multiple commissions and with various agencies. Rodriguez called for an investigation into the residency of a fellow councilmember, implying Councilwoman Priscilla Flores actually lives in a house she owns in Downey and not in Bell Gardens as she claims. She also said the city attorney should look into the legality of a councilman holding two offices, referring to Pedro Aceituno’s election to the Central Basin Municipal Water District board last November. The accusations are no surprise to her fellow councilmembers, who said Rodriguez is simply deflecting attention from her situation. According to city records, Rodriguez missed 10 of the 20 council meetings held in 2016. She was only excused on one occasion in July and left within a few minutes of arriving at a meeting in November. Under state law, if a city council member misses all regular council meetings scheduled within 60 consecutive days, his or her office becomes vacant. The complaint alleges Rodriguez’s Bell Gardens council seat became vacant on Sept. 24, 2016. “This council did not feel she should be getting paid if she isn’t showing up to do the work,” Flores said, explaining the reasoning behind the drastic action. During Monday’s meeting, Rodriguez said her long-playing illness had made it “difficult to function, to be in public,” later telling EGP she’d been sick for two years and needed time to heal, which meant “staying away from what was harming” her. She claims she even had to quit her job when things got really bad. Flores said the council gave Rodriguez ample time turn to in a doctor’s note so her absences could be excused, but she did not comply. According to court documents, Rodriguez was absent from July 26, 2016 through Sept. 23, 2016 and again from Oct. 11, 2016 through Dec. 11, 2016. Bell Gardens Councilwoman Jennifer Rodriguez, center, apologizes for her absences during Monday’s council meeting. EGP photo by Nancy Martinez. Rodriguez told EGP she was not in her “right state of mind” at the time and that’s why she didn’t take steps to be excused. A skeptical Flores, however, points out that Rodriguez was still able to attend public events where her daughter was performing. “We were getting complaints from residents,” she said. “If we didn’t do anything it would look like we were covering for her. If she was an employee she would have been fired a long time ago,” Flores said. As for Rodriguez’ accusations, Flores said claims about her not living in the city are untrue. “Bring on the investigation,” she said, adding she bought the house in Downey as an investment and it’s her sister who lives there, not her. The property on the 11900 block of Pomering Road is listed for $1.1 million on the Zillow real estate website; a sale is pending. Rodriguez believes the council is trying to oust her because she asked the city clerk last month to publicize the list of commissions and the stipends each council member receives for them. The list shows Aceituno serves on 9 of 15 city commissions and receives up to $250 for each meeting he attends. “[Holding office] has become a career for this individual,” accuses Rodriguez. Aceituno’s flexible work schedule made him more available to represent the city, said Flores, disputing Rodriguez’ claim. She added Rodriguez herself voted to approve the appointments. Aceituno told EGP that Rodriguez is trying to use the council as an excuse rather than taking “taking responsibility” for her actions. “It is what it is,” he said. Rodriguez disputes rumors circulating that her absences are little more than a “power trip” and that she’s angry because the council bypassed her for mayor last June. It was easier for Rodriguez to get donations for her nonprofit dance group when she was mayor, alleges Flores. “There’s a conflict of interest” there, she claims, implying Rodriguez used her elected position to solicit funds from local businesses that do business with the city. Rodriguez says she never used her title to get donations, but “simply explained the benefits of the program” to potential donors. She said the program gives local children access to art and “it’s a shame they are trying to make something negative out of something that has been positive for the community. Rodriguez, and the city for that matter, are no strangers to this type of political infighting. Rodriguez’ long history of heated exchanges with deceased mayor, Daniel Crespo, are well documented. Flores agrees, but blames Rodriguez for bringing back the turmoil. “I know there’s going to be retaliation against me and I accept it,” Rodriguez said before being interrupted by City Attorney Arnold Glassman, who said her statements had crossed the line of what is allowed during council orals. Mendoza attempted to call for a recess, but Rodriguez said she had a right to continue speaking. “This is what happens when government doesn’t want you to speak,” she said before storming out of the meeting. On Tuesday, Rodriguez, who was first elected in 2003, told EGP she had considered stepping down but now refuses to be forced out. She said she wants to leave office with her head held high, and as of now has no plans to seek reelection in 2019. Rodriguez told EGP she intends to defend herself against the court claim. In the meantime, she’ll focus on once again being accessible to the community. Updated: 3/29/17 to correct spelling error in headline.